Let’s face it, even though Netflix is probably one of the best streaming deals out there (especially if you’re located in countries where other premium streaming services aren’t available, such as Hulu, or HBO Go), some people just can’t afford it. Others might figure they won’t get enough usage out of it and don’t want to pay a monthly subscription for something they’ll only use once or twice. Luckily there are apps out there that allow you to stream movies and TV shows without paying a dime. The problem is the amount of free movie apps that claim to do the same. Which one should you choose? Which one is the best? Well, let’s find out. HOW DO FREE MOVIE STREAMING APPS WORK? Most free streaming apps use their built-in media player to play files from various file hosting sources, such as torrent websites. They make their money by using ad-based file hosting websites, which play an ad when an user accesses the file, giving a small percentage to the file owner. Almost every single free iPhone or Android movie streaming app is overloaded with ads, but they usually don’t interrupt your viewing experience. Most of them appear when you load the page and click on the media player. Some of the ads might be a little sketchy — it’s a legal gray zone, after all. User caution is always advised. Adblockers and script blockers are recommended, but don’t forget that by doing so you’re effectively denying income for the owners of the service you’re using. We will be reviewing 10 free movie streaming apps. All of them are free and virus and bloatware free. Some other apps that claim to do the same as these infest your phone or your computer with viruses and pesky toolbars. You don’t want to clean your phone every single time you watch a movie, do you? 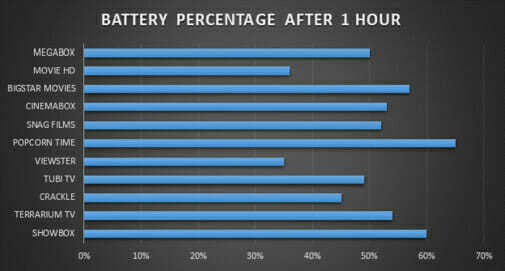 These reviews mainly focus on user experience, library size and stream quality, but also cover things as battery consumption, internet bandwidth and RAM usage. 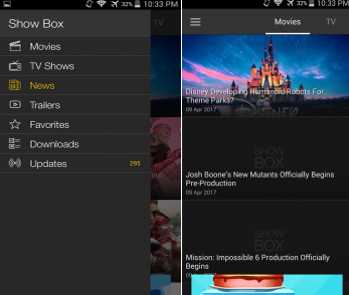 Showbox’s large movie library makes it one of the best free movie streaming apps for android. You just need to install the app and you’re good to go. Showbox has a menu bar at the top which allows you to choose whether to display movies or TV shows. Everything is very intuitive. 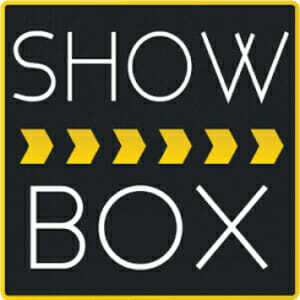 Showbox allows you to access the latest movie and TV related news. Unsure about what movie to watch? The trailer feature allows you to see trailers for every movie in their library. You don’t need to go all the way to YouTube to see if a particular movie is any good. It’s a welcome addition to any free movie app. You can bookmark your favorite movies and TV shows so you don’t have to keep searching for them. You can download movies and TV shows. Access them through the Download section and you’re all set, even if you don’t have any data left on your plan or there’s no wi-fi in the area. It’s one feature you don’t think about when you’re choosing your free movie app, but you’re certainly going to use it. 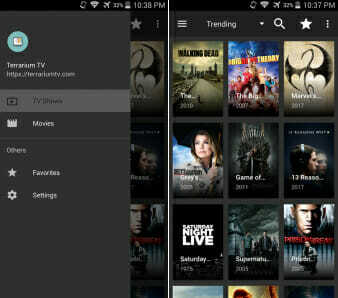 Offering a wide range of TV shows and movies in HD, Terrarium TV is also one of the most used free movie streaming apps. It’s available for every 4.0 or higher Android Device. Although with minimal extras (the Favorite tab is the only one it shares with Showbox), Terrarium TV also has a clean, intuitive interface. It’s a great free movie app if you’re not looking for any extras. 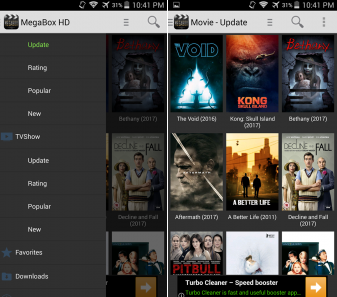 Megabox is indeed a mega free movie Android app. It has a huge updated library where you’ll find the latest movies and TV shows. The app offers a smooth experience and has one of the best interfaces on the list. It responds very well and has great looking animations that give the feeling you’re using a premium free movie app. There’s a lot of information about the available movies, such as its synopsis, the IMDB ratings and the year it was released. They’re all sorted in a very intuitive manner and you can browse them by genre or release date. As most related apps, Megabox allows you to curate your favorite list. You can create your one-stop “to watch” list. If your connection is spotty and you want to watch a movie without it having to constantly buffer, you can download it and watch it when it’s done. The download movies are all neatly arranged in the Downloads tab. As the name suggests, Cinemabox HD is a free movie app with loads of high definition movies and TV shows for you to watch. It’s available on both Android and iOS and doesn’t require any sort of account. Just download it and watch. The well-organized UI makes finding movies a walk in the park. It doesn’t have the same minimal look and the charm that makes some other applications feel like a premium experience, but it works. When you open the app you will find several movies sorted into their respective categories. 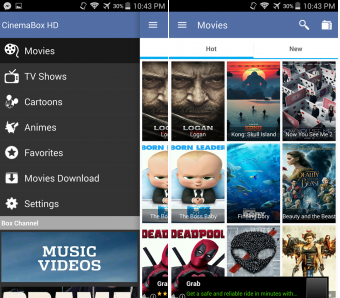 You may run into some errors when using free movie apps other than Cinemabox HD related with the file source from where the movie is being played. Cinemabox HD lessens the chance of file-source related errors due to the ability of changing the streaming host. If one host isn’t working, try another. Chances are you’ll be able to watch any free movie you’d like without a problem. Cinemabox HD allows the user to hide adult content. You can block movies you don’t want your children to see. Just lend them the phone or the tablet and don’t worry — they won’t be seeing anything you don’t want them to. 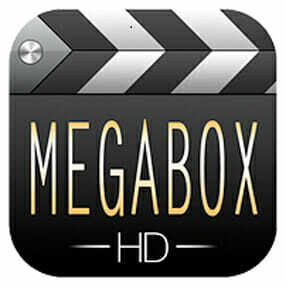 As with most free movie apps, Cinemabox HD lets the user download his movies and TV shows so he can watch on the go. 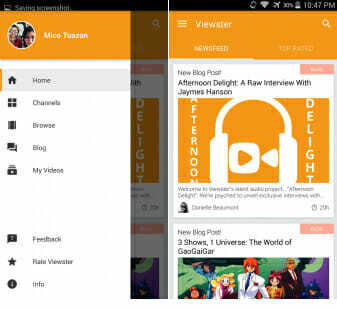 Viewster tries to connect its user base, allowing the user to read blogs besides watching movies or TV shows. This free movie streaming app is available for both Android and iOS. The videos on its library mainly tend towards anime, but if that’s not your cup of tea there’s plenty of other options. Viewster doesn’t really care about wowing the user. You open the app and you find the most recent videos. You can use the search bar at the top to find videos, or you can browse the menu on the left. It’s quite similar to Google play. Viewster is a free movie app which offers the user the ability to browse channels. Channels are divided in three categories: most recent, trending, and all. This organized interface makes it convenient to get in on whatever’s popular at the moment. Besides the video component, Viewster has several blogs available for its users. However, most blogs are anime related. Similar to a Favorite tab, My Videos lets you see the uploads of the channels you’re following. There’s also a history tab that lets you browse through what you’ve watched in the past. You can change the stream quality mid video. 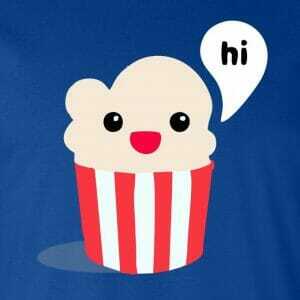 Popcorn Time is arguably the most popular free movie streaming app in the market. It is often called “the Netflix of torrents”. Popcorn Time is an open source bit torrent client with its own media player. Popcorn Time is available for Android, iOS and there’s even a Windows client. Popcorn Time’s design is sleek, but simple to navigate. On the main page you’ll find the latest additions to their library and on the top of the screen you’ll find the search bar. There’s also a menu button, from which you can select one of the different categories available. Like most free movie streaming apps, Popcorn Time allows users to curate their favorite list. Speaking of things most free movie streaming apps tend to have, there’s also the possibility to download movies and TV shows to watch at a later, internet-less, time. 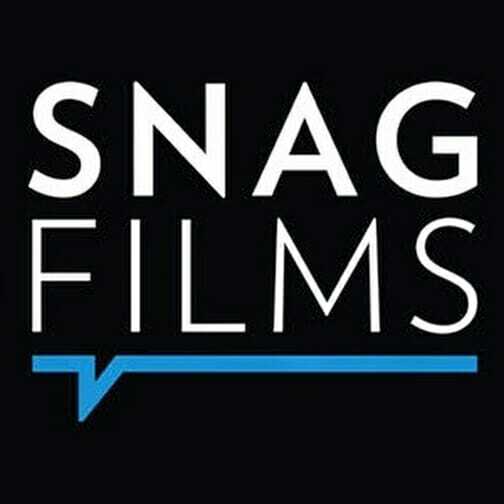 SnagFilms is a free movie app mainly focused on documentaries and independent films. They have a library with upwards of 5,000 titles. The app has few ads and loads of films. SnagFilms’ interface is sleek and modern, while remaining very functional. The main page shows featured films and relevant categories. As usual you have your search bar at the top and your menus on the left side. Most titles available can be streamed in either 1080p or 720p. However, there are a few issues that may hinder your experience. Buffer problems are all too common at higher qualities and fast forwarding the movie may cause it to break, forcing you to reload the page and start all over again. To fast forward a movie you need to select one of the lower qualities and then revert to a higher one. Tubi TV relies on upwards of 200 partners that keep their free movie app constantly updated with exclusive content. The landing page displays Tubi TV’s featured content. On the upper left corner you can find the menu button, which will let you choose the category you want to pick a movie from. Tubi TV tried to create a news section, however they don’t update it all that frequently. Points for originality, even if there’s not much effort behind it. 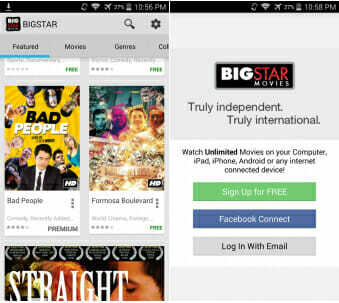 Offering a wide range of both Hollywood and Bollywood movies, Bigstar Movies is a decent enough free movie streaming app. It’s available for Android and iOS devices. There’s the possibility to become a premium user, with added functionalities, or to use it for free. The free version of this free movie app offers a low range of movies. If you pay 4.99$ a month you get an ad-free experience, as well as the ability to stream their entire library in HD. But if you’re paying why not use a tried and true method such as Netflix? 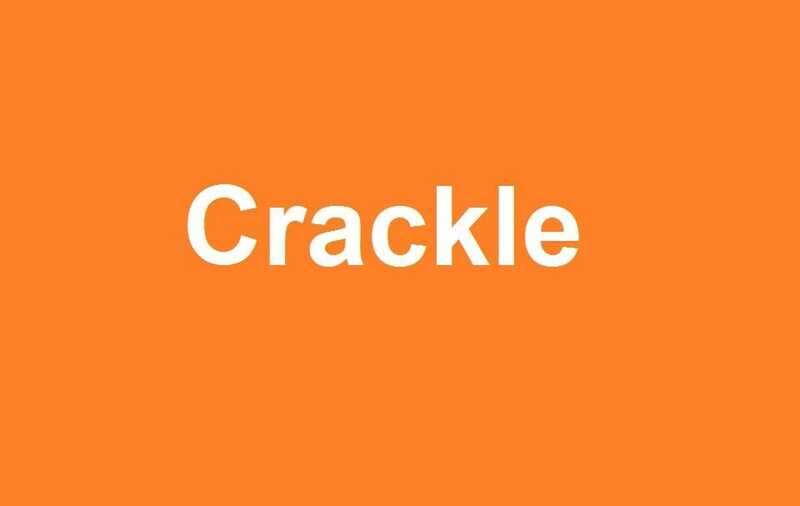 Crackle is Sony Network’s TV movie streaming app. Surprisingly, it’s free. Obviously it means that it comes with certain caveats. Crackle is available for Android, iOS and Windows. As you would expect from a name as big as Sony, Crackle’s interface is very intuitive and user-friendly. 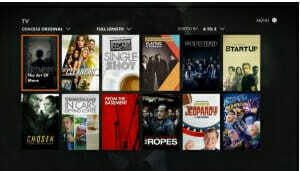 Movies and TV shows are in different sections, and the main page shows you what’s currently featured. Featuring movies from the 60’s up to the current day, Crackle offers hundreds of movies and at least 40 TV shows. As it should, Crackle also offers you the possibility to save your favorite movies and TV shows. Crackle allows you to pause your movie on one device and resume watching it on another without missing a beat. With Crackle’s Always On feature you can search for a movie while another movie plays. After getting to know every free movie app on the list, and despite having some clear favorites, let’s see how they perform. 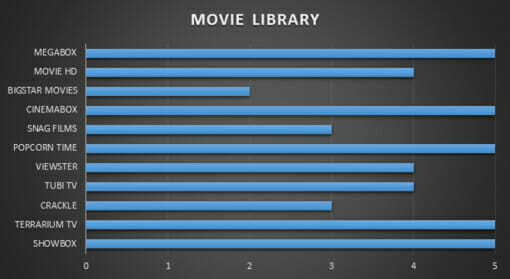 As you can see from the graph, Terrarium TV and Popcorn Time are the clear winners when it comes to free movie app’s streaming resolution. Both apps offer the user the ability to stream in 1080p. There’s a five-way tie for top spot. Almost every free movie app has a decent enough movie library. 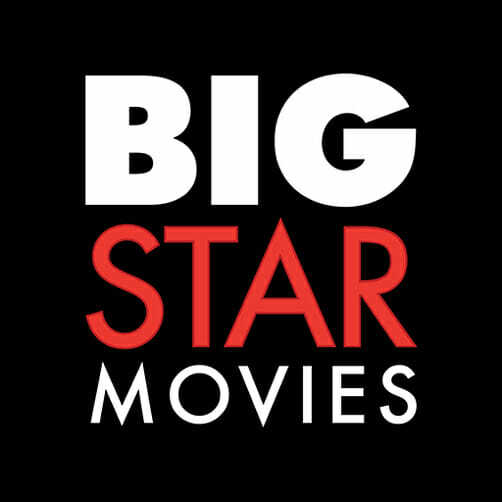 I’d advise you to steer clear from Bigstar Movies. Remember that Viewster and Tubi TV offer exclusive content that you won’t find on other platforms. 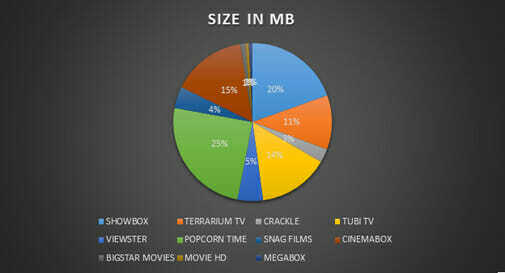 If you’re in the business of saving MB then there are three clear favorites: Movie HD, Megabox and Bigstar Movies. Each of the three free movie apps only take around 3MB. Using a quad-core Snapdragon processor we can see that the fastest in the group is Bigstar Movies, taking around 4 seconds to boot up. On the other hand, Crackle offers the slowest experience, even if just for a second. 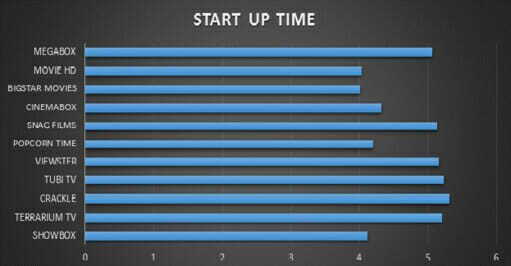 On average every app takes 4.5 seconds to boot up, which means they’re well optimized. To test these times we placed a 1Mbps cap on bandwidth. 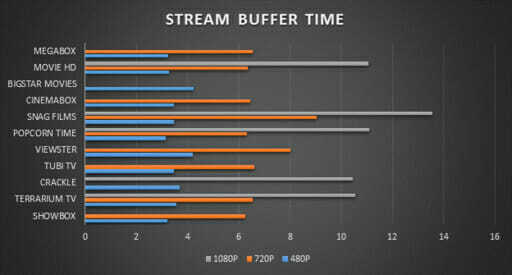 Bigstar Movies and Viewster load things slower than everything else when it comes to low quality streams. It took both free movie apps 4 minutes to load a 480p movie. At a higher quality we should mention the horrendous performance of SnagFilms — it took 9 minutes to load up a 720p movie. The streams also buffered every 20 seconds or so and took at least a minute to resume playing. You should ensure at the very least a speed of 3Mbps to stream high quality content without interruptions. Showbox and Popcorn Time use the lowest amount of battery, while Movie HD and Viewster are the fastest apps to drain your phone’s battery. If you don’t have a charger available, keep to Showbox and Popcorn Time. Crackle is the clear free movie app winner when it comes to RAM usage. 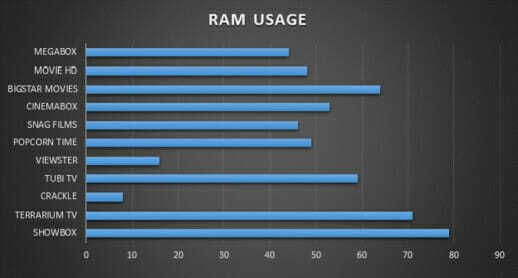 However, every app is well within the limits of acceptable RAM usage. – Fantasy stickers: Peanuts, Shrek, Snowman, etc. Stickers make your input more fun. – Type with Emoji: Provided 1000+ FREE Emoji, emoticons and other cute smiley faces explosion. – Custom keyboard: Personalized backgrounds, fonts and key-tones to DIY your own keyboard. – Rich themes: Lovely, Cool, Factional, Geek, you will find every keyboard you want! – Powerful language support: Support over 40 languages and adjust your language preferences automatically. ● Select your theme from many themes of the Classic Keyboard. The free movies you can access from the free movie apps include comedy, action, horror, drama, family, documentary, and many other types of films. There really is something for everyone. Tubi adds free HD shows and movies every week, so you’ll never run out of entertainment to stream on the go (and at home!). Our goal is to free as many categories of TV shows and movies as we can so you don’t have to pay for online entertainment (like you do for Netflix). All of our categories are free to choose from, including New Releases, Anime, and even a Not On Netflix category featuring free movies and TV series that you can’t find on Netflix or other popular subscription video apps. Now you can take Viewster’s selection of free, fan-favorite series and movies with you wherever you go. We specialize in niche picks across the fandom spectrum—from awesome Anime shows and gaming series, to throwback sci-fi movies, and geek-documentaries. Not to mention fresh content from some of the web’s most original creators. Download today and join our community of passionate fans! —No sign-up required; start watching immediately! —Growing selection of HD Anime. —Channels section: hand-picked series and videos from around the web. —Newsfeed-style homepage, showcasing recently added and featured content. —Follow your favorite channels to get updates and personalize your newsfeed. —Add series and videos to Watch Later to … um … watch later. Track, search, discover, and watch tv shows and movies from Netflix, Hulu, Amazon Prime, Showtime and over 300 more services. 1. 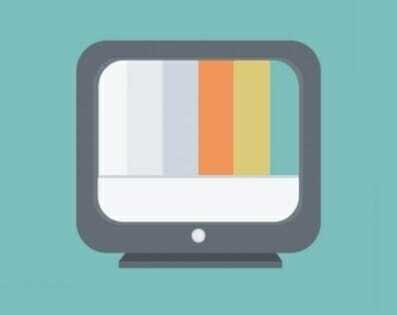 Universal TV & Movie Search Guide – Find where to watch TV Shows and Movies streaming online. 2. Personalized Suggestions – Based on the things you like. 3. Personalized Watchlist – Keep track of what you watch and what to watch next. 4. Personalized Daily Reminders – See what’s new each day. 5. Price Comparison – Find the free & cheapest ways to watch. 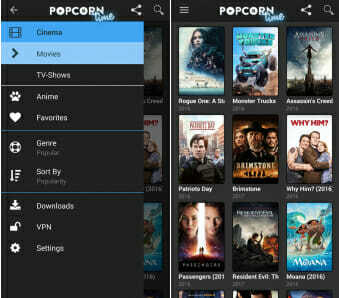 Popcornflix™ is great free movie app , the premium app for watching FREE feature length films on your Android phone and tablet! 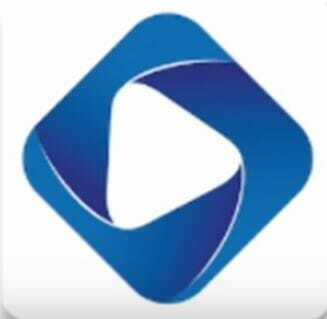 Download this FREE app to watch over 700 films instantly without any subscription or fees. Google Play Store is not available at Google Play Store as an app to download. So you can install APK file of Google Play Store for your Android devices from here . This will allow you to install any app that is not in the Play Store. You may think that APK is not a trusted app and thus it may not be safe. But, Untrusted simply means it is coming from outside Play Store. It does not mean it unsafe. HD Cinema Online is being used by millions of users across the world and does not harm your device. TweakBox is a feature-rich app! TweakBox is a very easy to use app installer, just open the app, go to your preferred category, and install the apps you want! Yep, TweakBox is and will always be Free, we support ourselves with Ad reveneue and Donations from our Patreons, Thank you very much! With over 7 Million users worldwide, we can surely say that over 90% of TweakBox users are completely satisfied with the service! Now download the Apps you want! This App Myanmar movie interface board to see a plan and download the App. Note – App interface board access plan. Optionally you can click the “Share” icon in Twitter (lower-right corner), select this app and it will take you directly to the download page. If you find a problem with the application, please kindly send me an email before giving it a poor rating.